Gartner has estimated business technology ownership costs is second only in cost to the business human resource costs. Understanding the real cost of IT isn’t exactly easy. There are a myriad of technical requirements, personnel turnover and technological advancements, having an IT infrastructure management partner you can trust is critical to your business. 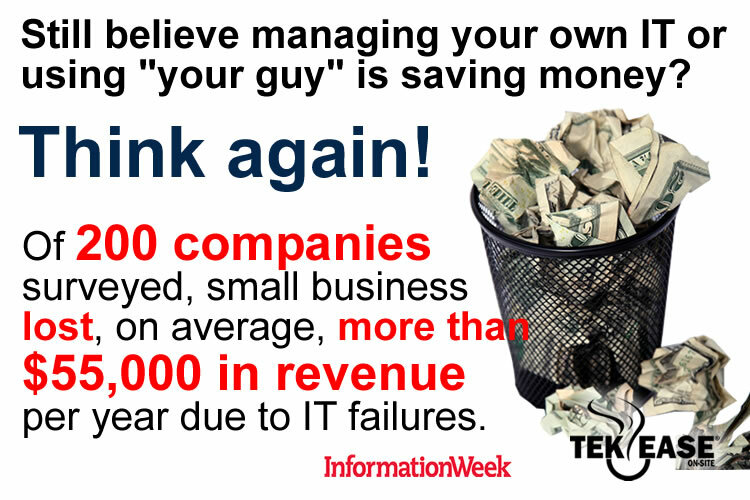 The TEKEASE ROI calculator helps you estimate your real technology costs compared to utilizing managed outsourced IT Services from TEKEASE. Total number of Microsoft PCs in your company? Total number of mobile devices (i.e. iPad's) in your company? Total number of Microsoft Servers you have in your company? Number of locations in your company? Average annual salary for your non-technical staff? Number of full-time IT staff you have? Average annual salary for your technical (IT) staff? Number of monthly hours purchased from external IT Services Providers? Typical hourly rate charged by external IT service providers? Hours spent monthly by non-technical staff supporting technology? The ROI tool is based on a 48 month computing lifecycle. TEKEASE Total Care Services Agreement will improve productivity losses by an average of 50%. Overall costs include equipment, Microsoft productivity applications, support costs, and lost productivity. The employee salary burden rate is estimated at 30%. It is important to note that this is an estimate. Every organization has unique technology needs. Many of the benefits you will receive from the TEKEASE solution are intangible. 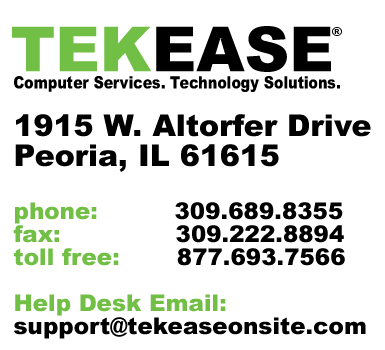 Please contact us to meet with a TEKEASE Technology Consultant for a more complete evaluation.